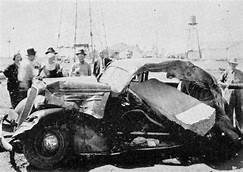 In March of 1937, a tragedy struck the town of New London, Texas the likes of which hasn’t been seen since. As horrible as the school shootings of today are, they don’t compare with number of lives lost on that fateful day. New London, in Rusk County, was one of the richest rural districts in Texas because of the oil fields gracing the landscape with their derricks. The school was beautiful, modern, and steel-framed. Its E shape made it like even more special and unusual. March 17, 1937 proceeded as any other spring day at the high school as students prepared for an inter-scholastic competition the next day. Students were in their classrooms, and the PTA met in the gymnasium, a separate building which escaped damage. Laughter, conversation, and teacher’s voices filled the air in the building. At 3:17 P.M., a teacher, Lemmie R. Butler, who instructed classes in manual training, turned on a sanding machine. Unknown to him, the air was filled with a mixture of gas and air. A spark from the switch of the machine ignited the mixture and carried the flame to a space beneath the building that was 253 feet long and fifty-six feet wide. As soon as that flame hit the air in that space, an explosion occurred and seemed to lift the building into the air. The building smashed to the ground with collapsing walls. The roof fell in and buried students and teachers in mass of brick, concrete and steel debris. People heard the explosion four miles away, and a slab of concrete was hurled 200 feet away where it crushed a 1936 Chevrolet. 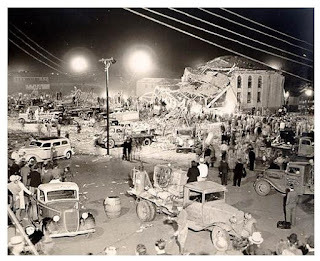 News of the explosion spread rapidly in the small town and relayed over telephone and Western Union lines to other areas. Those parents who had been at the PTA meeting frantically searched for their children. With no way of communicating with them, the parents started digging through debris with bloodied hands and mournful cries. Community residents as well as workers from nearby oilfields came with their heavy duty equipment to remove debris. Within an hour, Governor James Allred had sent out the alarm for aid to the victims. Texas Rangers and the highway patrol responded immediately. Workers dug through the debris all evening, and floodlights were set up in order to continue the digging as night came along with rain. Seventeen hours later, everyone had been accounted for and digging stopped. Debris was also removed from the site as bodies were recovered and laid out on the grounds to be identified. Tragically, many of the bodies were burned almost beyond recognition or blown apart and could only be identified by pieces of clothing or some other personal item. An elementary school bus driver, Lonnie Barber, saw the explosion, and even though his son Arden attended the school, Lonnie did his duty to safely deliver his students to their parents before returning to the school to help with the recovery and learning his son, Arden died in the blast. The Mother Francis hospital in Tyler canceled its dedication ceremonies to take care of the injured, and Texas Funeral Directors sent twenty-five embalmers to take care of the dead. The school had a population of 500 students and forty teachers. Of that number, 294 died with many others severely injured. Only 130 students of the 500 escaped serious injury. Funeral homes provided individual caskets, graves and funeral services for the victims. The funerals took days to complete with some families losing all their children. The story made headlines or news stories in newspapers all over the country. Such a tragic loss of children had saddened the entire nation. 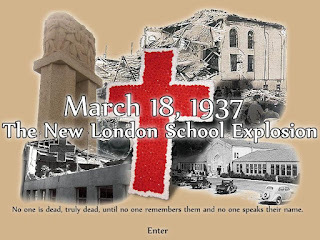 The strong, faithful citizens of New London decided to rebuild the school and it reopened in 1939 directly behind the location of the destroyed school. 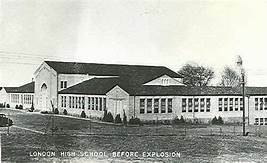 It remained a New London school until 1965 when they consolidated with another district and it became West Rusk High School. In 1938, they also decided to erect a monument so the catastrophe would never be forgotten. 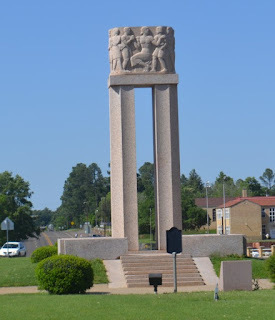 In December of that year, they contracted for the building and erection of monument to a quarry in Llano, Texas with Donald Nelson of Dallas as designer and architect. Seven Texas sculptors submitted models and Herring Co of Beaumont was award the job of modeling the structure. The cenotaph was made of Texas granite and depicts twelve life-size figures to represent children coming to school bringing gifts and handing in homework to teachers. The massive structure weighs twenty tons and is seven feet high and four feet thick. The piece of granite was lifted to stand on two monolithic granite fluted columns. The twenty foot high columns rise over a granite platform reached on two sides by granite steps. The overall height comes to thirty-two feet. The base contains the names of each individual who died in the explosion. 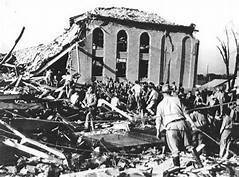 A museum was also erected with artifacts and pictures of the explosion as well as newspaper accounts from all over the world and even a letter from Adolph Hitler expressing his condolences. 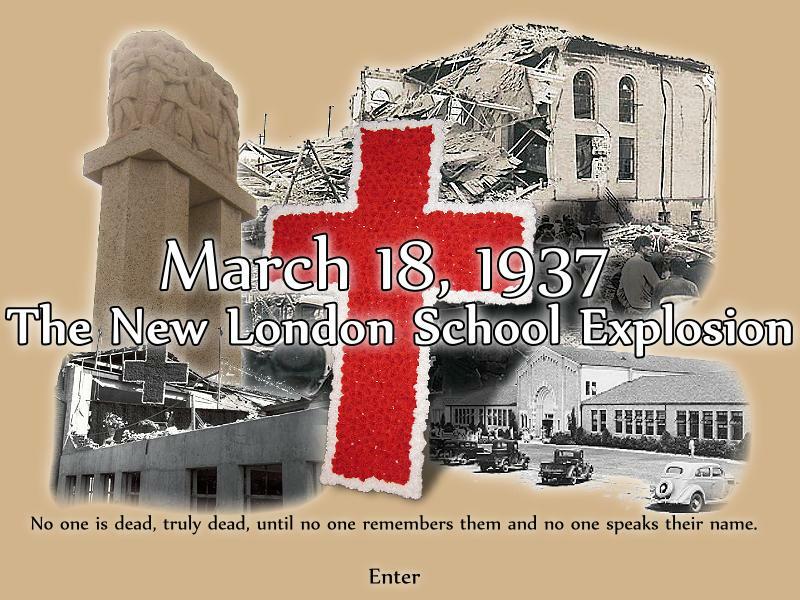 The museum is there as a reminder for the people of New London to never forget what happened that March day in 1937. Martha Rogers is a multi-published author and writes a weekly devotional for ACFW. Martha and her husband Rex live in Houston, Texas where they are active members of First Baptist Church. They are the parents of three sons and grandparents to eleven grandchildren and great-grandparents to four, soon to be five. Martha is a retired teacher with twenty-eight years teaching Home Economics and English at the secondary level and eight years at the college level supervising student teachers and teaching freshman English. She is the Director of the Texas Christian Writers Conference held in Houston in August each year, a member of ACFW, ACFW WOTS chapter in Houston, and a member of the writers’ group, Inspirational Writers Alive. Oh! What a tragic event! Thank you for giving light to this horrific story. Thanks for stopping by, Connie. The tragedy reshaped so many lives that day. We don't want people to forget. This is such a tragic event! Thank you for sharing it, Martha. It's good to remember and to share these stories so those who suffered are not forgotten. Thanks for stopping by, Gabrielle. Yes, we must never forget those touched by great tragedies like 9/11, Columbine, Las Vegas, high school in Florida, the church in Sutherland Springs, Texas, or Santa Fe, Texas to name a few. Such a sad thing. But it's good to remember. Thanks for sharing this. What a tragic event for many years ago. Thank you for sharing this sad historical event, Martha. It's always nice to read how individuals came together to remember the lives loss. Thanks for stopping by, Marilyn. Few, if any, survivors from the high school are still with us. Those who were alive to remember it are well into their 80's and 90's. I was less than a year old when it happened. Thank you Martha for documenting this terrible event. Several laws were made concerning the installation of natural gas piping in homes and buildings as well as the addition of odorizing chemicals to natural gas so a leak like that could be detected. I read about those and should have included them in my article. Thanks for dropping by and commenting. Oh my! I had never heard this tragic story. The sadness and grief is beyond my comprehension! It was a tragic day for East Texas, and the stories have been passed down through generations so it will never be forgotten. Thanks for stopping by, Connie.